This is how most people feel all the time. How do you create and build a personal brand? First, what is a personal brand? Most people think of celebrities as the only people who have personal brands but the truth is that everyone has them. It’s just that celebrities usually get paid a ton of money and have the access to endorsement platforms. We (the audience) can’t help but notice their personal brand because a company is advertising it to get their product more exposure. But here I’m just talking about you and the personal/professional brand that you project to others. If you need a definition of personal brand, I really like this one. A brand is a person’s perceptions of their experiences with you. If people think you are a good listener and then you do what you say you are going to do for them, they will form a good opinion of your personal brand. If you do the opposite, then you know what happens. Consistently is the keyword there. Trust of your brand is built up over time but it can be destroyed pretty quickly if you veer off the consistent path of your brand perception. In this day and age of hyper connectivity and massive information overload, your personal brand can help raise your profile and get people to notice who you are quickly. In Harvey Coleman’s book, “Empowering Yourself, The Organizational Game Revealed” he talks about the PIE chart – Performance, Image and Exposure. Performance means your day-to-day work and results. Image means what other people think of you and your work. Exposure means who knows who you are and what you do. Mr. Coleman maintains that what we are told is that our performance means everything to your career – if you do the work, keep your head down and just work a little on your image, you’ll be fine. That may have worked in the theory but it’s not how it works now. While your performance means the world to your brand, you have to put significant thought into your image and work on getting exposure. Here are some questions to ask yourself. PERFORMANCE: Can you say that you know what you are doing and you can answer questions about it? If you can’t answer this yourself, you really need to stop and question what it is that you do. This should not be confusing or vague to you because your entire brand will be built on this. It can change over time or position, but it is the essence of your brand. IMAGE: Do you feel like others trust you with what you say you do? People have very acute sense of BS detectors when you talk about what you do. You should have an acute sense of how they are reacting to you when you talk about what you do. EXPOSURE: Do others come to you instinctively when they need something related to your field? This should not be defined by your title. And don’t blame others if they aren’t coming to you, it’s your fault if they don’t know what you do. I hear that quite a bit that people should know – no, they shouldn’t just know – they should be exposed to what you do. More importantly, do you feel that management knows what you do, is excited about what you do and would come to you if they needed help? This can make or break your brand. If your boss and your boss’s boss don’t come to you, there’s a serious issue there. When it comes to budget cuts, you’ll have a lot more issues defending your budget if they don’t easily understand what you do. This is branding. 1. You need to define who you are professionally. Every brand is a story. What’s your story? Here’s how you create your story. What are you known for? What do you want people to think when they think of you? Write a brand statement for yourself. Here’s a template I use. To (target audience), (your name) is the (blank) provider/service of (blank) delivered through (blank). 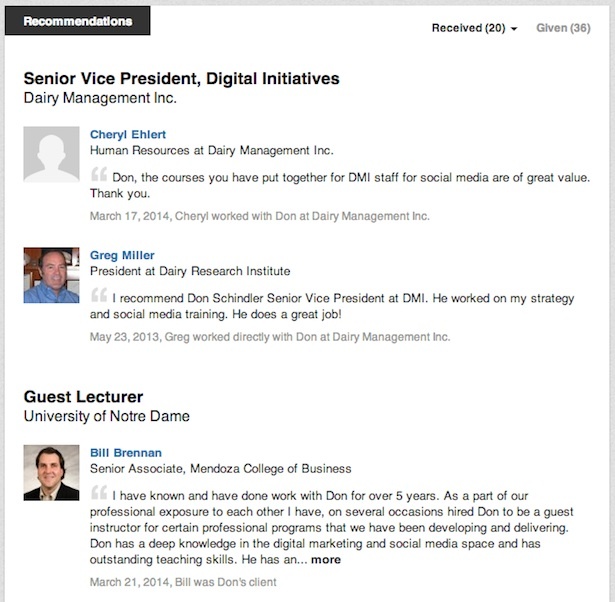 To the dairy industry, Don Schindler is a thought leader for creative integrated marketing and communications solutions delivered by digital communications and educational training. 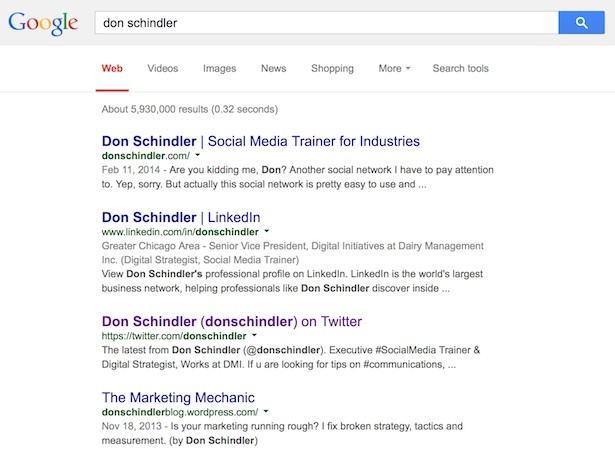 Here it is reduced to 140 characters: @donschindler is a creative marketing professional who teaches you how to use social media and digital communication tools. 2. You need to create your elevator pitch. An elevator pitch is how you would describe what you do to someone who has an issue that you can solve. You can provide them with a solution – you should always approach knowing you have a solution to their problem. For me, my idea clients are people who are struggling with their communications especially digital communications. I can give your staff the communication skills to tell a story to your audience that will get them to act the way you want. Even if you think all your staff knows how to do is send out a press release. Guarantee to work. If not, you’ll get your money back. The guarantee is to form the basis of trust. I know what I’m doing and I trust it to work if you follow my steps and are willing to do the work. Because with every interaction (whether a question or conversation), I promise to give you the best possible return for your time taken with me. And you can trust me to be honest, to have your best interest in mind, to give you a reason, to focus on you and what you are trying to accomplish, etc… Just remember that trust is very fragile. If you go off brand or don’t deliver, it will be broken and it’s very, very hard to earn back. 3. You need to craft your stories. Trust me, you are a storyteller. Now that you have your elevator pitch and the image definition of yourself, you should start crafting your stories that promote your image. How do you craft your stories that match your brand image? Be You – authentic, natural you. This is where trust is the highest. Talk to people like friends – when you are talking with friends, do you worry about the story you are telling or do you just tell it? Most people have no problems telling stories when the pressure is off – you are relating what has happened that your friends would find funny or interesting. By “being you”, you relate authentic stories – this is what captivates an audience. Use your experiences – very few storytellers can use another’s story and pass it along as their own. Again, people have a high BS meter. You have experiences that should relate to what your audience wants to know. You might have to sit down and write them down – that’s ok – but don’t be inauthentic. It will burn you in the end. Practice – use your brand stories and watch out people react. Did they laugh, did they cry, were they indifferent? Over time, you’ll know which stories to use. Remember audiences want to react – they may not trust you in the beginning – but they want you to entertain them on both an individual level and in a group setting. With practice, you’ll get better and understand when to pause and when to speed up the story. I’m a big proponent of sharing and I wrote an entire post on it. It’s the secret to personal branding. I view all social media as a chance to share and get exposure. I do not view it as a “private” me area. If you want a private me area, then I suggest using other platforms beyond social media. Now I know I’m the digital guy but I believe in the traditional tools of the trade for personal branding. You need this foundation set before moving on to anything shiny and new like social media. Whether you gather contacts from an event or online connection, all of them need to be housed in a central location. This can be your company’s CRM (customer relationship management) tool or if you want to just use LinkedIn or a simple spread sheet in Google Docs (keep in the cloud so you don’t lose it if your computer dies). Your email tool, like Outlook, is not a CRM and is difficult to transfer data back and forth between other tools. With digital communications tools you can shape your professional brand to make it look the way you want it to. Here I’m talking about the different social media tools. Here’s my how to get started using a blog. Here’s how to get started using LinkedIn. Connections are everything – connect with everyone you meet in business. Correct people’s profiles and summaries for advanced search. Groups can be strong but difficult to maintain. Tag others in updates to get their attention. Understand there is more reading/stalking then interaction. 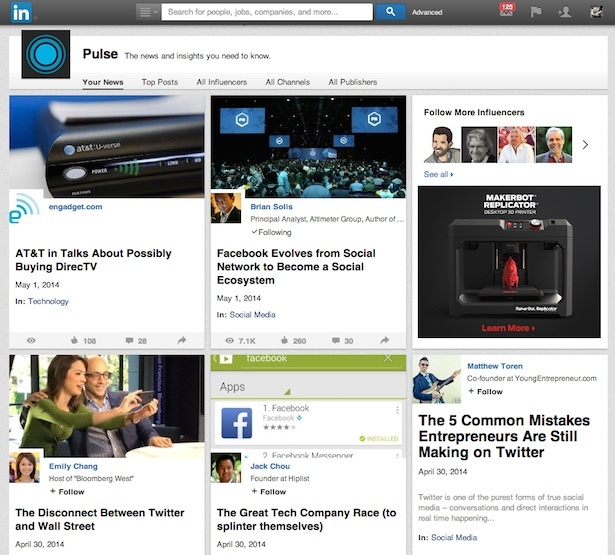 Use LinkedIn Pulse and share relevant content to your networks. Here’s how to get started using Facebook. Try and use graphics or videos with links to drive back to website. Funny stuff drives a lot of engagement along with questions. Worry more about engagement and not numbers (straight from Facebook). Pay for play on Facebook. Here’s how to get started using Twitter. Use third party apps to control like Hootsuite, Tweetdeck, Tweetcaster. Here’s how to get started using Pinterest. Don’t have How To’s on these networks yet but I recommend checking them out. Help others first. Highlight them, encourage them and in return they will be there for you. Don’t rant or be a Debbie Downer. Negative posts garner initial attention but it fades quickly. Don’t try and do all networks at once. Pick one and dig deeper. Schedule some time for it. 20 minutes a day if you can. There are a couple of free tools that can help you monitor your brand. Talkwalker Alerts – This will monitor you on the web. Mention.com – This will monitor you via social media. To measure your brand simply ask people who they think you are and what you do. If they don’t know or get it wrong, then you need to adjust your message or possibly your exposure. Make sure you are googling yourself – what does it say you are? Make sure you sign out if you are logged into Google and delete your history so it doesn’t effect your search. It’s even better to check from an outside source or computer. So a long blog post but I think it’s got some really good stuff in there. What would you add? What’s the secret to creating your personal brand strategy? Share. It’s pretty simple, right? 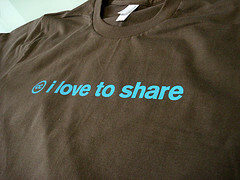 When I teach Personal Brand Strategy, I get a lot of confusing looks when I talk about sharing and exposure. I know what the class is thinking – this isn’t what we were taught in school. In fact, I was taught that the work you do is enough. You don’t need to talk about it. Because if you do what you do amazingly well, people will talk about what you do. You will be noticed. But remember Steve was extraordinarily good and his job was to be on-stage in front of millions. I’m guessing that with your job, you don’t have a stage to stand on. That makes it a little harder to be noticed. And I completely agree with that. He’s bragging. And that’s worthless. Because he’s not helping anyone. And I would argue that he isn’t even coming close to helping himself as much as he thinks he is. But this doesn’t have to be case when you talk about what you do. 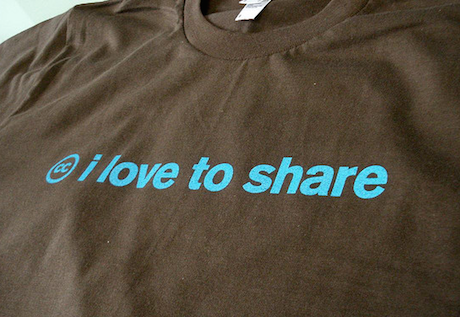 Think of it from the perspective of sharing. Share your work, share your knowledge, share your failures and what you’ve learned from them so others can learn from your mistakes. I just listened to a podcast from James Altucher (you should definitely be listening to him) and his guest, Austin Kleon: How To Be A Creative Genius. In the podcast, they talk a lot about sharing your work – daily if you can – will get you noticed. When I talk about how to use professional branding to be noticed, I used to talk about exposure. Exposure is what I want you to have but sharing is what you do to get exposure. Help others out. Help them get to where they are going. Help them to understand not just what you do but how you can help them. This is why I use social media, why I blog, and why I don’t care if you think I’m bragging (I don’t see it that way). I want you to know that I’m there for you and that I care. And they know you care when you are willing to share what you know. When you do this, your professional branding will take off. What’s your secret to a successful personal brand? 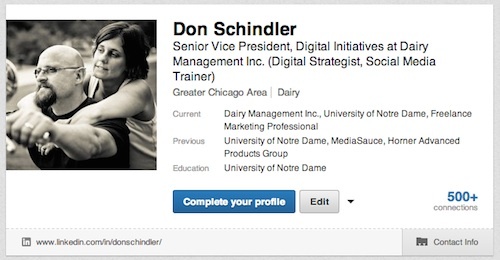 Why should you be using LinkedIn as an executive? Most people would probably question me about why I’m so passionate about technologies that many people would consider old-fashioned in the digital age. Like LinkedIn and blogging. But let me explain why I believe that Linkedin still has a lot going for it. Even more than many other networks (looking at you Facebook and Twitter). Relationships are everything in business and digital relationships count now. Back in the day, you had to look someone in the eye and shake their hand to make a deal. That was before the lawyers decided that it was better to have a signed contract in case someone didn’t hold up their end of the deal. Now I would say that I’m more trusting of a person who I can observe digitally – if I can see what they’ve done and who they’ve done it with. The business world has shifted slowly into the digital realm (definitely not as quickly as consumers) and I now trust the relationships I have on LinkedIn even when I haven’t met the person face to face – why? Because over time, I’ve made a lot of handshake deals and heard about a lot of deals done through Linkedin. It’s a relationship I can count on even if it is digital. Your rolodex needs to be in the cloud. When I was first in business, I couldn’t wait to get my new business card. I passed them out like candy. Here I am – make sure I get in your rolodex – I’m a legitimate part of the business world. Now I can never find my own business cards. I feel bad to when someone asks for my card. Why? Why do you need it? Isn’t this just an obligation now? You are just going to forget it in your bag when you get back to the office. Just Google me and you’ll find my information (on LinkedIn). But as a marketer I understand that the business card is a takeaway and a reminder to connect with me via LinkedIn. Nowadays I try and link up on Linkedin with everyone I’m going to meet ahead of time if I can. Why? Well, I can see their face and be forever connected to them; therefore, it doesn’t matter if I don’t get their card. Food production conversations are happening, where is the dairy industry? 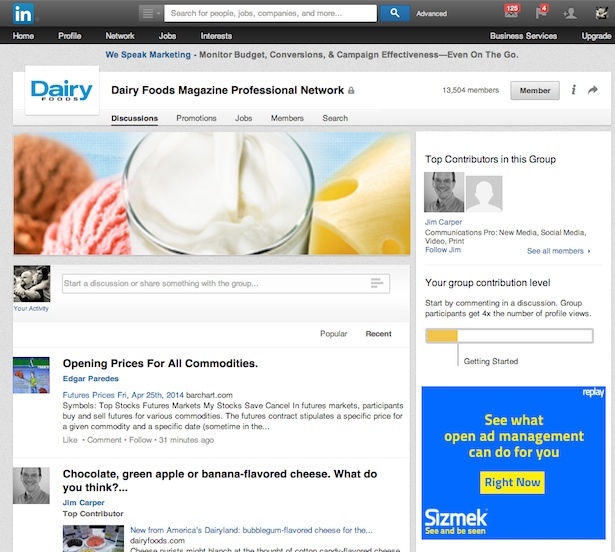 When it comes to finding the dairy industry on Linkedin, it’s pretty easy. Just do a search on the company you are looking for and you’ll discover new connections through your network. Why so few? I’m not really sure here. Maybe the industry is just slower to adopt new technologies (hmmmm…that’s not really true when you look at how dairy is processed today – they love technology for making the product safer and easier to process). The dairy industry is full of wonderful leaders with category breaking ideas. By joining Linkedin and connecting with the Dairy and Food Groups that are out there, you can meet up with others in the industry, to share ideas and learn new things about the future of the dairy industry. But you have to be there first. Signing up is free – dedicating a small portion of your time (like 20 minutes a week) to LinkedIn could get you a partnership or product. You just never know. But what will happen if you don’t join? Nothing. Simply nothing. What happens when someone Googles you? When someone Googles you, where is your professional bio? So who have you Googled recently? A speaker for a conference? An ex? A celebrity who just did something racy? What happens when someone Googles you? You need to logout of Chrome or Firefox first. Or even pick a different browser before Googling yourself. What comes up? Anything? What does that say about you? LinkedIn is a powerful website and if you put content into it about you there’s a good chance that it will show up on the first page. And if that person Googling you is looking for your business acumen, then you can guarantee they are going to research your profile. Here’s a chance to put your best foot forward and also have some control over what Google says about you. Recommendations can make or break your reputation. Others vouch for your reputation. Getting recommendations isn’t the easiest thing to ask for but LinkedIn makes it about as easy as it can get. By just clicking a few links, you can send a recommendation email (they even halfway write it for you). Then once you have your recommendation, anyone visiting your profile can see. Your recommendations are always there and they are tied to the other person so they can be asked about the recommendation they gave. If you want recommendations, the best thing to do is give a few out. There are people you’ve worked with that have done some extraordinary things for your career. Let them know and you are likely to receive in return. You can meet others outside your industry. When you go to industry conferences, it’s doubtful you are meeting with a lot of people outside your industry (you know, besides vendors who have very different intentions meeting you). LinkedIn gives you the opportunity to meet people over topics (I really like the Marketing Over Coffee LinkedIn Group and my Notre Dame Alumni Group). And since it is on Linkedin, the conversations are geared more to business than groups on Facebook or Google+. Smart job searches start with connections not search engines. Jobs of the future don’t have much to do with résumés. A résumé is still a requirement but many HR departments will head straight to your LinkedIn profile to get a more thorough look at your career as well as check to see who you are connected with. Don’t you see how this will be the same for our kids – in fact, your connections might be the ones that get them a job. This is where business news is shared. Tired of digging through various newspapers to find good business articles? Use LinkedIn Pulse and you’ll see business news that is focused on your tastes – not on the general business public. Mine centers on technology and communications business – imagine that. Every thought leader is judged against TED. How can you call yourself a thought leader and not be digital? This seems like a no-brainer but if you want to be a mover-and-shaker in the dairy industry and you aren’t using your social tools to communicate, I believe you are making it more difficult for yourself to be trusted as an industry leader. LinkedIn is the first step and probably the easiest one to take. Mentoring happens both in person and on the web. You can teach the next generation of leaders how to be leaders – via the web. Many leaders I know say they don’t have time to use things like LinkedIn yet they usually want to mentor the younger generations on how to be better leaders. If you use LinkedIn and connect with these younger leaders you can mentor many of them at once. Your updates can be tidbits of how you do leadership, sharing articles, and engaging with them. You can mentor them on how to interact with people both online and offline via the tool. We need your professionalism and opinion on these networks so younger leaders have someone to follow beyond their peers. So how do you get started using LinkedIn, here’s a how to set up a Linkedin profile. Do you need help with your personal branding, I can do that. Just hit me and we’ll go through the process of setting up your brand.